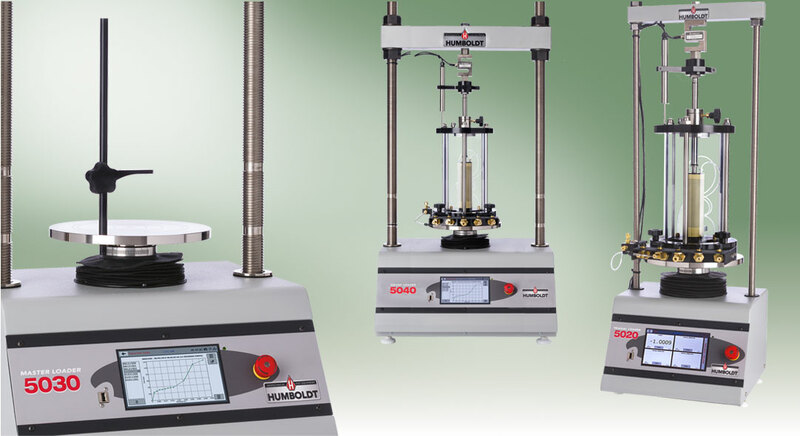 Humboldt’s Elite Series Load Frames provide the materials testing lab with a choice of three highly-versatile and precision-built loading systems covering a range of testing applications. Elite Series Load Frames feature a 7" (178mm) touch-screen controller giving you finger-tip control of your testing processes, as well as providing real-time, visual views of your data in both tabular and graphic formats. In addition all Elite Series Load Frames also include Humboldt’s NEXT software, which provides robust machine and test control, and report generation. 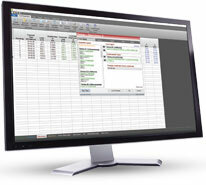 It also provides the ability to control and monitor multiple machines from a single computer. These load frames are built with durable, high-quality components and feature the use of a stepper motor, precision gears and gear box to ensure smooth and reliable operation, as well as precise results. All Elite Series Load Frames provide four (4) integral and independent data acquisition channels — enough channels to handle almost any application you may have. Load frames feature 7", color, touch-screen displays providing finger-tip control in stand-alone mode. Now you can monitor the progress of your test with a quick glance at the actual graph of your test in real time. You can also control all your testing functions from the display, including calibrating instruments to any of the four channels included with each load frame. Load frames can also be controlled by computers with access to the local network. 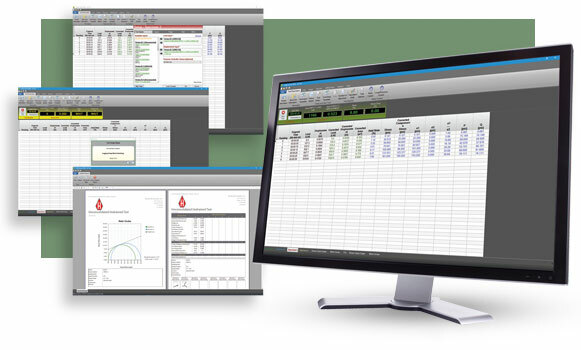 View and control testing operations from a PC in the lab, in the next room or at a different location, while also providing report generating capabilities using Humboldt’s NEXT software or our enhanced test-specific modules. HM-5030 Master Loader is ideal for just about any application from road construction to high-volume commercial and educational laboratories. 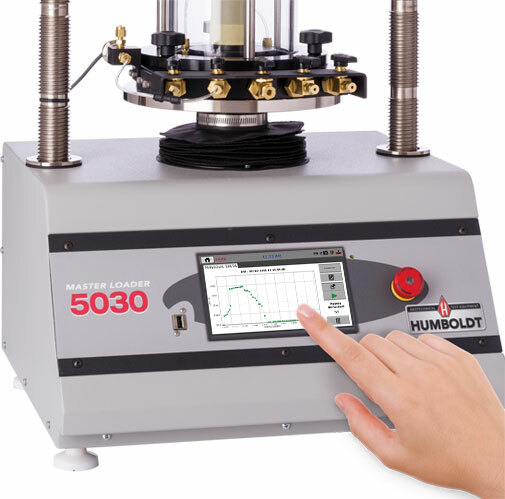 While the HM-5030 has been specifically designed for soil testing labs conducting multiple testing operations including: UU, CU and CD triaxial, UC, CBR and LBR, it is also perfect for running Marshall, Hveem, TSR and SCB asphalt tests as well. A small-footprint, triaxial-specific load frame that provides the versatility, precision and durability found throughout Humboldt’s elite series load frames. The HM-5020 Triaxial Loader has been specifically designed to handle triaxial testing applications, including: UU, CU and CD triaxial and UC. 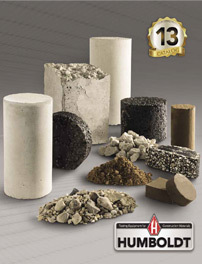 Ideal for just about any application from road construction to high-volume commercial and educational laboratories, which require higher pressure loading capacities up to 22000 lbf (100kN), such as those involving larger sized samples and samples comprised of rock and rock/soil mixtures. It’s wider stance and large vertical and horizontal clearances allows it to accommodate much large sample cells. Smooth, reliable operation. Precise results.